4th Battalion attached 1st Lincolns. William was the second son of James Gardiner Baird, the 8th Bart of Saughton Hall Midlothian, formerly Lieutenant of the 7th Hussars, late Lt Colonel and Honorary Colonel Lothians and Berwickshire Imperial Yeomanry, and of the Honourable Arabella Rose Evelyn Hozier, the eldest daughter of the first Baron Newlands. He was born on the 18th of April 1885, was educated at Eton and Sandhurst and served for a time in the 7th Dragoon Guards and Scots Guards, afterwards retiring from active service and joining the reserve list as 2nd Lieutenant in the 4th Bedfords. William was gazetted a Captain in the Bedfordshire Regiment on the 11th of August 1914 and went to the front attached to the 1st Battalion of the Lincolnshire Regiment. 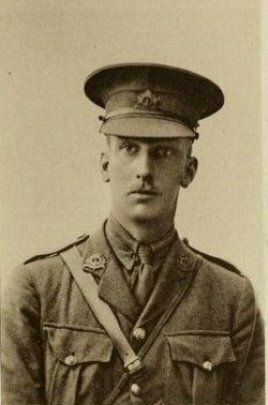 Captain Baird was wounded in an attack on Neuve Chapelle on October the 27th or 28th and died on the 5th of November in hospital at Boulogne, where he lies today. He was a member of the Cavalry Club and of the New Club Edinburgh and an underwriting member of Lloyds of London. Lieutenant Stonor was from the the 4th battalion attached to the 2nd battalion, the South Staffordshire Regiment and was the son of the late Francis Robert (4th Baron Camoys) and of Lady Camoys of 25, Gilbert St., Grosvenor Square, London. He went abroad in January 1915 and was killed two months later. Lieutenant Stonor has no known grave but is remembered in the Le Touret Memorial to the missing. Alexander was in the 4th battalion, attached to the 2nd battalion of the South Staffordshire regiment. He was the son of John Dalzell Sprunt and Jane Naismith Sprunt, of Montgomerie, Berkhamsted, Herts. Born at Hampstead, London. B.A. and is buried in the Lillers Communal Cemetery, 15km north-west of Bethune. Lieutenant Dickenson was in the 4th battalion, attached to the 1st Royal Irish Rifles. He was the son of the Rev. F. W. Dickenson, of Inworth Rectory, Kelvedon, Essex and is buried in the Merville Communal Cemetery, 15km north of Bethune. Walter Leland was from the 10th battalion, attached to the 1st Royal Dublin Fusiliers and was the son of Dr. and Mrs. A. B. Leland of 5 Kensington Court, Kensington in London. He has no known grave but is remembered on the Helles Memorial to the missing, Gallipoli. Frederick was from the 10th battalion, attached to the Essex Regiment en route as a reinforcement when he was killed. He was the son of Mr. and Mrs. F. H. Casswell, of "Dovercourt," Pollard Hill North, Norbury, London. Second Lieutenant Casswell has no known grave but is remembered on the Helles Memorial to the missing. Lieutenant Riddell was from D Company, 9th battalion but attached to the Essex Regiment when he was drowned. He was the son of Frederick George and Charlotte Riddell and the husband of Clara Elizabeth Riddell, of 38, Ramsden Road, Balham in London. He had served in the South African wars as a Sergeant in the North Somerset Imperial Yeomanry. Lieutenant Riddell has no known grave but is remembered on the Helles Memorial to the Missing. A teacher at the Municipal Technical Institute in Belfast before the war, Lieutenant Adair was from the 10th battalion, attached to the 1st Border Regiment on Gallipoli. He was the son of Mrs. Elizabeth Adair of 2 Century Street in Belfast. John has no known grave but is remembered on the Helles Memorial to the missing. John Ameshurst Tennant was born 27 March 1889 in South Kensington, London, the son of John Tennant Esq. & Margaret Croom. He was educated at Harrow School and London University where he received at Bsc. in Mechanical and Civil Engineering in 1911. Following his graduation he was employed by the Egyptian Government Irrigation Service at Tatah in the delta and later Luxor in upper Egypt. With the outbreak of war he returned to England and was commissioned into the Bedfordshire Regiment, posted to the 10th Battalion and was gazetted Captain in February 1915. 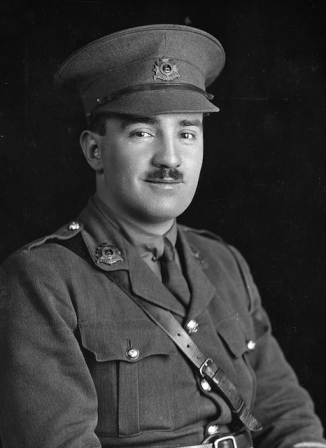 In June 1915 Captain Tennant was attached to the 1st Border Regiment and was sent with a draft of 80 men to Gallipoli. He participated in the heavy fighting at Gully Ravine on 28 June 1915. Captain Tennant was fatally wounded about 5 p.m. on 21 August leading Coy. A, 1st Borders, during the final futile assault on Scimitar Hill at Suvla Bay. He was evacuated to the hospital ship HMHS Rewa offshore and died of his wounds the next day. Captain Tenant was buried at sea shortly thereafter. John was the son of John and Margaret Croom Tennant, of 19 The Boltons, South Kensington, London. His brother William was killed in action in May 1915 at the battle of Festubert and the family's third son - Hugh Vincent - died in Spain in 1927 from the effects of gas shell poisoning received in the Great War. James was training in the 10th battalion when, presumably, he died from an illness. He was the son of James Rae, of 58, Mildred Avenue, Watford and lies in the Watford Cemetery, Hertfordshire. Second Lieutenant Mitchell was from the 3rd battalion, attached to the Trench Mortar Battery. He had been serving abroad since the 15th August 1915 and was the son of Mrs. M. A. Mitchell, of 59, Danecroft Rd., Herne Hill, London, and the late E. C. Mitchell. Walter has no known grave but is remembered on the Loos memorial to the missing. Lieutenant Walker was in the 10th battalion, attached to the Nigerian regiment, W.A.F.F. He has no known grave but is remembered on the Zaria Memorial in Nigeria, 80km north of Kaduna. 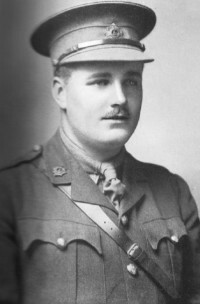 Second Lieutenant Harris was in the 4th battalion, attached to the 1st Lincolnshire Regiment and is buried in the Cite Bonjean Military cemetery, Armentieres. Charles was from the 10th battalion, attached to the 69th Company of the Machine Gun Corps. He lies in the Tranchee de Mecknes cemetery at Aix-Noulette, 16km north of Arras. Merton College, Oxford also remember him and record more biographical details on their site here. Lieutenant Harvey was attached to the 1st battalion of the Essex Regiment when he was killed. 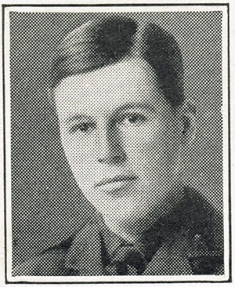 He was the son of the late Herbert Rhys Harvey and M. A. Harvey, of Clifton, Bristol and has no known grave, but is remembered on the Thiepval Memorial to the missing. Geoffrey was born on 6 March 1888, the only son of Archibald Day (who would later become the Reverend of Malvern) and Jane Day. His early years were spent at The Vicarage in Malvern Link, followed by education at Marlborough. The Emmanuel College War Magazine (August 1917) records: "From Marlborough he passed to Peterhouse, where he gained a Double First in History, and was proxime accessit for the University Essay prize. He was captain of the Peterhouse hockey team, and was a keen player of Rugby and Association Football. For a brief period he was a master at the Gresham School, Holt, from which he was elected in 1912 to a Fellowship and History Lectureship at Emmanuel. " "The two years of his residence at Emmanuel were too full of human interests and teaching work to give him much opportunity for Historical Research, although he left behind him some material for the study of the early economic history of the West Indian Colonies. He was a sympathetic and successful teacher, and his pupils did well in the History Tripos. He was on the best terms with his colleagues and with the undergraduates, and his rooms were the scene of many cheerful gatherings. He was an enthusiastic and skilful motorist, and his cycle-car was one of the features of Cambridge life. He had no illusions about the glories of war, and had a marked disinclination for the military life: he joined up solely from a sense of duty, and always looked forward to the time when he might get back to his books. " On 28 August 1914, Geoffrey enlisted into the British Army, becoming a Second Lieutenant in the Bedfordshire Regiment. In December 1914 he led the funeral procession in Bury, following the death of the 19 year old Private Wood during training. Sailing with the battalion to Gallipoli in August 1915, Second Lieutenant Day sustained four shrapnel wounds during the battalion's assault on the Kiretch Tepe Sirt; a severe wound to the lower left jaw as well as wounds to his right hand, right forearm and right thigh. After two and a half weeks on Lemnos to stabilise him, he went to the Ras-el-Ton hospital near Alexandria then left for the UK on 3 October 1915. During his recovery, he moved between his family home at The Vicarage in Malvern Link and Halton Camp in Tring. By January 1916 just the jaw wound remained and by mid March he was passed fit for light duty following six operations to restore his jaw, although he was unable to eat solid food until that summer. From June 1916 he was posted to the Eastern Command School at The Keep, where he remained briefly until called for overseas service again later that summer. The Emmanuel College War Magazine (August 1917) adds that "Through all his sufferings in hospital, intensified by his refusal to take any anaesthetic, he kept his cheery manner, and when he recovered, avoided the temptation of a safe job, and was eager to return to active service. He was determined to see the thing through, whatever the cost to himself." Lieutenant Day was posted to the 1/8th Battalion of the Royal Warwickshire Regiment in France, during the Battle of the Somme. While acting as Temporary Captain in command of a Company he was wounded in the arm during an attack on 27 August 1916. Ignoring the wound and pressing forward, he was killed an hour later but his resting place was lost and he is remembered on the Thiepval Memorial to the Missing. Major Snell was from the 1st battalion, attached to the 1st/4th King's African Rifles. Eric was born in Berbice, British Guiana and had been the Assistant Commissioner in Uganda, having been educated at Bedford School and Royal Military College, Sandhurst. He had served in Egypt from September 1914, been mentioned in despatches and later transferred to a post in Africa, where he was killed. Eric was the only son of Dr. George Snell and of Mrs. Snell of 29 Cecil Court, Redcliffe Gardens, West Brompton, London and is buried in the Dar Es Salaam cemetery, Tanzania. Lieutenant MacGregor was in the 3rd battalion, attached to the 132nd Company of the Machine Gun Corps. James was probably killed during the Battle of Mohammed Abdul Hassan and he lies in the Amara war cemetery, Iraq. Second Lieutenant Taylor initially served in the 7th battalion from early 1916, but was attached to the 54th Trench Mortar Battery when he was killed. He has no known grave but is remembered on the Thiepval memorial to the missing on the Somme. Victor was attached to the 34th Squadron, Royal Flying Corps. He was the son of Charles J. and Grace Dora Berridge, of 10, Childebert Road in Upper Tooting, London and lies in the Crucifix Corner cemetery, Villers-Bretonneux on the Somme. Reginald was in the 5th battalion, attached to the Machine Gun Corps in Mesopotamia when killed. He was the son of the Reverend J. W. Balding of 41 Chatsworth Road in Croydon, Surrey and is remembered on the Basra Memorial as well as the King's School Memorial in Ely. Captain Foster was attached to the 1st Essex Regiment when he fell. He was the son of Mr. and Mrs. John Foster, of 66, Kimbolton Rd., Bedford and the husband of Annie C. Foster, of 36, York St., Baker St., Marylebone, London. Harold has no known grave but is remembered on the Arras Memorial. Eric had been trained at the Sandhurst Royal Military Academy after enlisting in 1914. He was wounded serving in the 1st Bedfords in 1915 and served as a recruiting officer whilst recovering. In 1916 he was an intelligence officer at Albert on the Somme, before being attached to the 1st/5th Battalion of the Durham Light Infantry in the 50th Northumbrian Division. He was the only son of Eric Edwin & Nellie Coulson-Mayne of 30, Green, Richmond and is buried in Warlincourt Halte British Cemetery F. 120. Lieutenant Stonier was with the 2nd battalion, attached to 2nd Squadron, Royal Flying Corps. Although originally posted as missing in action, it was later assumed that he had been killed. He has no known grave but is remembered on the Arras Flying Services Memorial. Hugh was in the 4th battalion, attached to the 38th or 48th squadron of the Royal Flying Corps. He was the son of Mary E. Patterson, of Spearpoint, Ashford, Kent and lies in the Warlincourt Halte British cemetery, Saulty, 22km from Arras. John was from the 1st battalion, attached to the 12th Gloucesters. He has no known grave but is remembered on the Arras Memorial to the missing. William was born in April 1859. At the age of 19 he joined the 15th Regiment of Foot transferring to the Indian Army and taking part in the Afghan Campaign of 1878-1880 whilst serving with the 24th Bombay Native Infantry. He transferred to the Bombay Staff Corps in 1881 and was promoted to Captain in 1889, Major in 1898 and Colonel in 1904. In 1914 having completed 35 years of service he was still officially on the strength of the Staff Corps by then he was living in England at Overton Lea, Parabola Road Cheltenham. He married Miss Mary Catherine Emily Price-Morris of Plas Court, Denby and Oak Manor, Hales Road Cheltenham. Their son - William Price Barrington Piers - was born in 1905. William was secretary of the East Gloucester Tennis and Badminton Club and had been a very fine player winning the Veterans Cup. He was also an organiser of the West of England Hockey Championships. He started the Cheltenham Corps of the National Reserve whilst waiting for his appointment in the army. At the outbreak of war, aged 55, he volunteered and on the 7th of November 1914 was appointed to command the 10th (Reserve) Battalion of the Bedfordshire Regiment formed at Dovercourt and later in training at Colchester. William died suddenly of a heart attack on the 27th of June 1917 having recently retired at the age of 58. He is buried at Cheltenham Borough Cemetery. Malcolm was born in 1874, the youngest son of Frederick Charles Pawle of "Northcote", Reigate, Surrey, and educated at Marlborough College. At school he was a member of the Shooting Eight and in 1891 he made the second best score for the school at Bisley. 'Never of very great physical strength', he suffered in the climate and was invalided home due to illness. On recovery he returned to duty in England, but soon volunteered for foreign service again and was sent to India as a Captain in a 2nd Garrison Battalion of the Bedfordshire Regiment. Second Lieutenant Creasey was in the 1st battalion, attached to the 22nd squadron of the Royal Flying Corps. Arthur was the son of Arthur Tuxford Creasey and Beatrice Mary Creasey, of 114, Northumberland Park, Tottenham, London and is buried in the Aubigny communal cemetery extension, 15km north-west of Arras. Lieutenant Nixon was trained in the 3rd/5th battalion and transferred into the Royal Flying Corps at some point. He initially went to the Western Front in September 1916 and it is probable that he served initially in the 8th battalion as he reported on the disappearance of a fellow officer from that battalion in January 1917. However, by the 17th March 1917 he was in the 2nd Western General Hospital, Manchester. Presumably, he transferred into the Royal Flying Corps after his recovery and may have died as a result of a flying accident, although this is unconfirmed. He is buried at the Radlett (Christchurch) Churchyard Extension in Aldenham. Percy was born in 1876 in Valparasio, Chile and was educated at Clifton College, Bristol. 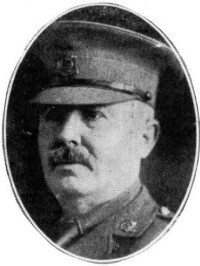 Lieutenant Colonel Balfour was from the 3rd battalion, but in command of the 2nd/7th Worcesters when killed. He was the son of James Balfour and Rachael Ogilvie and the husband of Maude Edith Balfour, of 5, North Sq., Golders Green in London. Lieutenant Colonel Balfour lies in the Fins New British Cemetery, Sorel-le-Grand, between Cambrai and Peronne. Major Smith was serving in the 1st Garrison Battalion of the Bedfordshire Regiment and is buried in the Delhi War Cemetery, India. Alfred was attached to the Royal Flying Corps and is buried in the Jerusalem War cemetery, Israel. Arthur was in the 4th battalion, attached to the 4th East Lancashire Regiment. He was the sSon of Elizabeth Ingram, of The Lodge, Latchmere Rd., Kingston-on-Thames, and the late Charles Ingram. Captain Ingram has no known grave but is remembered on the Arras memorial to the missing. Lieutenant Collymore was from the 9th battalion, attached to the 25th battalion of the Machine Gun Corps. He was the son of Mr. and Mrs. F. Collymore, of Barbados, British West Indies and husband of Mrs. H. R. Hill (formerly Collymore), of 19, Mayfield Avenue, Bolton, Lancs. Hubert has no known grave but is remembered on the Tyne Cot memorial to the missing. Herbert had returned from Argentina to enlist in 1914 and served as a Second Lieutenant in the Royal West Kents in France from May 1916. After recovering from a wound, he was fit enough for garrison duties and was moved into the 2nd Garrison battalion of the Bedfordshire Regiment, stationed in India. Herbert was the son of Thomas Richard and Ellen Thompson, of Gillingham, Kent. He lies in the Karachi Cemetery, grave A/E. A. 6. and is also remembered on the Delhi Memorial (India Gate). Major Henry Dubois O'NEILL, M.C. 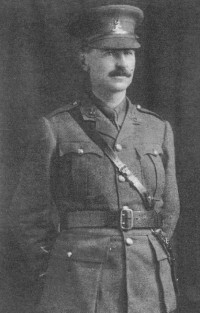 Major O'Neill died whilst attached to the Middlesex Regiment. He was the son of the late Henry Edward O'Neill and husband of Margaret Theodora O'Neill. Henry is buried in the Bexhill Cemetery, England. 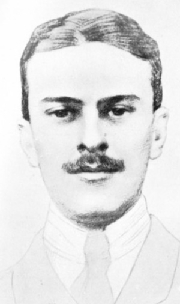 Second Lieutenant Heigham-Plumptre died whilst attached to the R.A.F. and lies in the St.Riquer British Cemetery, 9km away from Abbeville. Died of wounds 2nd July 1918, aged 21 Arthur was from the 7th battalion, but attached to the 6th Northamptonshires when he died. He was the son of Joseph Robert and Sophia Lydia Pratt and lies in the Noyon New British cemetery. Edmund was attached to the 112th Trench Mortar Battery and is buried in the St. Amand British Cemetery, 17km east of Doullens. Francis Oertling was commissioned into the 5th Battalion but served in the 5th Squadron of the Royal Air Force. He died of wounds on the 8th August 1918, aged 27. Lewis was the son of Henry and Emily Oertling of Barnes in Surrey and is buried in grave VI.B.6 of the Vignacourt British Cemetery in France. He can be seen in a group photograph here. William was in the 2nd battalion, attached to the 5th Royal Berks. He was the son of Mr. and Mrs. F. W. Stapleton, of Hong Kong and lies in the Peronne Road cemetery, Maricourt, 10km from Albert on the Somme. Stephen was originally Private 48063 in the Bedfords before being commissioned as an officer. 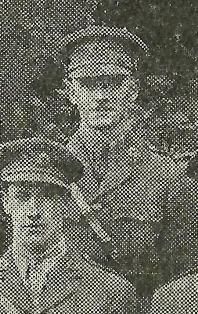 Second Lieutenant Allen joined the 4th battalion in the field on 30th July 1918 and is recorded as being killed in the 7th Royal Fusiliers, both of which were in the same Brigade. Hence, it would appear that he transferred to them, losing his life within weeks of arriving on the front lines. He was the son of William and Gertrude M. Allen, of "Morwenstow," 39, Southbourne Rd., Bournemouth and is remembered on the Vis en Artois Memorial to the missing. Captain Robert Kenneth WRIGHT, MC. Killed in action 29th September 1918. Robert initially served as a Corporal in the Cape Mounted Rifles but was a Captain in the 6th battalion, attached 2nd Worcesters when he fell. He is buried in the Pigeon Ravine Cemetery, Epephy, 21km north-east of Peronne. Reginald was attached to the 1st Northamptons when he was killed. He was the son of Arthur and Lily Strange, of 206. Beech Hill, Luton, Beds and lies in the La Vallee-Mulatre cemetery, 11km south-west of Le Cateau. Lieutenant Courthorpe is recorded on the 'Soldiers Died in the Great War' database as being in the 4th battalion attached to the RAF and his Medal Index Card appears to verify a connection with the RAF. However, he initially went to the Western Front, landing on 5th October 1915 and joining the 1st battalion two days later. He now lies in the St. Germain-Au-Mont-D'Or Communal Cemetery extension. Killed in action 23rd October 1918, aged 27. Lieutenant Stables was in the 6th battalion but attached to the 1st battalion, Northamptonshire regiment when he fell. He was the son of Walter Williams Godfrey Stables, M.R.C.S. and Isabella Mary Stables (nee Drury), from 5 Auckland Road in Upper Norwood, London. Leonard is buried in the Highland Cemetery, Le Cateau. Harold Lever initially enlisted as Private 32235 in the Bedfords and was commissioned on 27th November 1917. Second Lieutenant Lever is shown as dying in the 5th Battalion in France, so must have died attached to another given that the units of the 5th battalion were stationed in Palestine or England, unidentified unit. He is buried in the Tournai Communal Cemetery, Allied Extension. George initially enlisted as Private 33078 in the Bedfords and was later commissioned. Second Lieutenant Timmons was killed whilst attached to the 1st battalion of the Northamptonshire regiment. He was the son of James and Annie Timmins j husband of Elizabeth Timmins, of 77, Callcott Rd., Brondesbury, London and lies in the Highland cemetery, Le Cateau. Died at home 14th November 1918, aged 33. Thomas was a solicitor's clerk before the war who was born at Barham in Norfolk. Although he was commissioned into the 5th Bedford's, 2/Lt Davis was wounded whilst attached to the 43rd Light Trench Mortar Battery and died at home in Norwich on the 14th November 1918, aged 33. He is buried in grave 55.324 of the Norwich cemetery. He was the son of Thomas Edward Davis (formerly of the Norfolk Constabulary) and Ellen Harriet Davis (nee Pigg), of 34 Cavalry Street, St. James in Norwich. Captain Toovey served in France at some stage but died in the 13th (Transport Workers) battalion of the Bedfordshire Regiment and lies in the Paines Lane military cemetery, Harrow, Middlesex. His widow lived in Flat 3, 13 Warrington crescent, Maida Vale in London after the war. Reginald landed in France on New Year's Day 1916 and served in the 8th Battalion for the first half of the year. Having survived 6 months holding the line around Ypres and a German attack in April, Reginald had an accident which resulted in him being invalided home that July. He does not appear to have recovered completely from the wound and contracted Pneumonia and died at Brocton Camp on the 5th of November 1918. Died 5th December 1918, aged 25. Lieutenant Soloman was in the 6th battalion attached to the 4th Aeroplane Supply Depot of the R.A.F. Harry probably died from the Spanish Flu that ravaged Europe in 1918 and 1919, although I have not found any firm evidence to support this to date. He was the son of Nathaniel Solomon of 5 The High Street in Aldershot, and of the late Minnie Solomon. He is buried in the Aldershot Jewish Cemetery. Captain Blundell had served in Egypt from January 1916 but was in the 12th (Transport Workers) battalion of the Bedfordshire Regiment when he died. He was the son of Edmund Snow Blundell and Annie Elizabeth Blundell, of 9, The Vineyards, Bath and is buried in the Bath (Locksbrook) cemetery, England. Percy initially enlisted as Private 3034 of the 23rd battalion, the London Regiment and was commissioned into the Bedfords on the 29th March 1917. Captain Hall was serving in the 13th (Transport Workers) battalion of the Bedfordshire Regiment when he dies. He was the son of Mark and Laura Elizabeth Hall, of 7, Meteor St., North Side, Clapham Common, London and is buried in the Battersea (St. Mary's Battersea Rise) cemetery, London. Killed in action 2nd April 1919, aged 35. The 'Soldiers Died in the Great War' database refers to Captain Bailey as being from the 6th Bedfords attached to the 6th battalion of the Yorkshire regiment. I have been unable to find evidence to support the link to the Bedfordshire Regiment to date but have included him in case something comes to light at a later date. Thomas was the son of the late James Battersby Bailey and Louisa F. Bailey of 11 Herne Hill Mansions in Herne Hill, London and is buried in the Archangel Allied cemetery, Russia. Second Lieutenant Harding was in the 5th Battalion but attached to an unidentified unit when he died in France. It is possible that his service abroad started after hostilities had closed too, as he does not appear to have been awarded any medals, although I have yet to find a service record to verify this. William was the son of William J. and Frances E. Harding of 19 Horston Road in Leicester and was a native of Erdington in Birmingham before the war. He is buried in the St. Sever Cemetery Extension at Rouen. Captain Harry DRIVER, D.S.O., M.C. Harry Driver served in and won his gallantry medals in the 7th battalion of the Bedfordshire regiment on the Western Front. After the war he volunteered for further service in Russia and was killed whilst attached to the 46th Royal Fusiliers there. He was the son of Joseph Briggs Driver and lies in the Archangel Allied cemetery, Russia.